Over 100,000 people have been killed since fighting broke out in Syria more than three years ago. As a result of the drought, Syria could be forced to import more than than the 5.1 million tonnes of wheat it needed last year, the WFP said in a report. It blamed delays in receiving funds from international donors, saying it has only received 22% of the funds it needs for its operations in Syria. 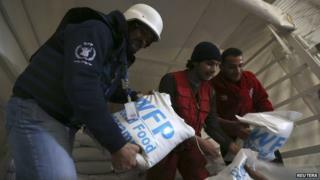 The WFP says it provided food for a record 4.1 million people in Syria in March. Meanwhile, Syrian state media says that that Iran has sent an extra 30,000 tonnes of food supplies to the country.